Adobe® Technical Communication Suite 4 is a powerful, integrated toolkit with single-source authoring, rich multimedia integration, and multichannel, multiscreen HTML5 publishing capabilities. Create XML/DITA content natively with Adobe FrameMaker® 11. Publish virtually anywhere using Adobe RoboHelp® 10. Deliver engaging, interactive content with graphics, demos, and more using Adobe Illustrator® CS6, Adobe Captivate® 6, and Adobe Presenter 8. Rapidly collaborate with reviewcapable PDF documents. Work faster with cross-product integration—Leverage tight FrameMaker—RoboHelp, FrameMaker—Illustrator, FrameMaker—Photoshop*, FrameMaker—Acrobat, and RoboHelp—Adobe Captivate integration for superior content creation and delivery. Integrate content from other suite components natively in FrameMaker and speed up time-tomarket. Easily author and enrich XML/DIT A content—Natively author XML/DITA content with role-based views, XSLT 2.0 and XPath2.0 support, Smart Paste, Quick Catalogs, and DITA 1.2 enhancements. Liven up content with stunning graphics, product demos in HD, engaging FLV and SWF videos, and interactive presentations. Publish to multiple channels, formats, and screens using multiscreen HTM L5—Publish contemporary technical content to virtually any device with multiscreen HTML5 and other popular formats. Make your publishing workflow highly extensible by simply specifying the screen size and layout. Optimize content display for a better reading experience, and preview it while authoring. Increase enterprise productivity—Deliver content faster using productivity boosters for individual contributors and collaborating teams. Improve your throughput with rapid authoring features, PDF-based reviews, native connectivity with CMSs, automatic code and content suggestions, and error-tracking. Adobe® FrameMaker® 11—Adobe RoboHelp® 10 integration—Publish technical content to a wide range of formats without leaving your favorite authoring environment by invoking Adobe RoboHelp 10 from within Adobe Technical Communication Suite 4. Retain powerful features such as Graphic Styles, Silent Publishing, and Automap styles when importing FrameMaker documents into RoboHelp. Adobe FrameMaker 11—Adobe Illustrator® CS 6 integration—Leverage the advanced image editing capabilities of Adobe Illustrator CS6 from within the native FrameMaker environment. Explore new paths with the essential vector tool to tackle complex designs with the power of native 64-bit support that helps speed up your largest projects and the most demanding effects. Native XML Code View—Dive directly into XML code using the Code View. Exercise complete control over XML documents with a host of editing features, including customized toolbars, inline attribute editor, automated tracking of errors, Intelliprompt of attributes and elements, search using XPath, and advanced XSLT features. Multichannel, multiscreen HTM L5 publishing—Usher in the future of publishing technical communication by delivering rich, interactive content virtually anywhere. Publish frameless, SEO-friendly, cross-browser, cross-platform multiscreen HTML5 output to a wide range of channels (such as mobile, web, desktops, and print) and screens (including tablets and smartphones). Multiformat publishing—Make your technical content available to users in the format they prefer. Publish to multiscreen HTML5, WebHelp, CHM, eBook (EPUB 3, Kindle Format 8), native mobile apps (iOS, Android, Blackberry, Windows, Symbian), Adobe® AIR®, PDF, Microsoft® Word, Adobe FlashHelp®, JavaHelp, EclipseHelp, and OracleHelp for Java™. Integration with Content Management Systems (CMS s)—Smoothly integrate with best-of-breed CMSs like EMC Documentum and Microsoft SharePoint via built-in connectors, and others using third-party plug-ins. Get a set of APIs to connect your enterprise authoring environment with virtually any CMS. Improve searchability of content with custom metadata. XSLT 2.0 support—Create a variety of transformation scenarios by applying pre-defined or customized XSLT to XML files. Execute these transformations using a range of JAXP-compliant processors, such as Xalan and Saxon. Define the scope of the transformation—a file, all files of a folder, DITA map or all children of a book. XPath 2.0 support—Eliminate the need to browse through numerous lines of XML code. Use the XPath Pod to find your elements and automatically apply functions to them. Customize your query builder, get suggestions, define the scope of queries, use the history dropdown feature, and save search results for greater productivity. Device-based screen profiles—Leverage the scalable, extensible multiscreen HTML5 format to make output look its best on a range of devices. Create new profiles, specify a range of dimensions or resolutions for each of them, provide screen frame images for better previewing of output screens, and specify the browser agents to use to access the content. Customizable screen layouts—Choose from out-of-the-box layouts for desktop, iPhone#, iPad#, Kindle Fire, and more, or define custom layouts and map them to screen profiles. Edit the topic style, content, and search features in each layout. Conveniently change styles using a toolbar. Preview pages to see how the layouts will appear. Rapid authoring—Speed up XML authoring with a range of productivity features such as Intelliprompt of elements and attributes, template based structure suggestions, automatic insertion of end tags, dynamic validation, and pretty printing. Work faster with large XML/DITA files and DITA maps in multiauthoring environments. Multi-authoring productivity—Enable real-time collaborative content creation and increase productivity in multi-authoring environments. Experience superior performance when accessing RoboHelp projects from a shared location on enterprise networks. Manage assets across users and projects with Microsoft® SharePoint. Reuse shared assets and shrink time-tomarket. Integration with Adobe Acrobat X Pro—Make your review workflow more inclusive. Use Acrobat X Pro to publish commenting-enabled PDFs, that anyone can review using only the free Acrobat Reader software. Collaborate faster and smarter with improved capabilities to accept, reject, aggregate, and sort comments during roundtrip PDF reviews. Adobe® FrameMaker® 11—Adobe RoboHelp® 10 integration—Publish technical content to a wide range of formats without leaving your favorite authoring environment by invoking Adobe RoboHelp 10 from within Adobe FrameMaker 11. Retain powerful features such as Graphic Styles, Silent Publishing, and Automap styles when importing FrameMaker documents into RoboHelp. EPU B 3 and Kindle Format 8 (KF8) support—Deliver content to smartphones, tablets, and eBook readers in EPUB 3, KF8 and Mobi formats. Publish to devices (such as iOS and Android™ smartphones and tablets, Amazon Kindle, Barnes and Noble NOOK™, Sony Reader™) and reader apps (such as Adobe Digital Editions, Calibre, Aldiko, and iBooks)^. Rapid creation of eLearning content—Rapidly author interactive eLearning and HTML5-based mLearning content with Adobe Captivate 6. Easily create product demos in HD, application simulations, and softskill and compliance training. Liven up courses with actors, themes, and interactive elements. Roundtrip with Microsoft PowerPoint 2010. Enhanced video support—Develop richer, more engaging technical content by adding a variety of high-impact multimedia features. Enjoy robust support for video content in MP4, FLV, and SWF formats. Customize videos by selecting posters and creating links with text, to play, pause, or jump. Q: What is Adobe® Technical Communication Suite 4? A: Adobe Technical Communication Suite 4 is an integrated toolkit with single-sourcing, rich multimedia and multichannel, multiscreen HTML5 publishing capabilities. Author XML/DITA content with Adobe FrameMaker® 11. Publish virtually anywhere using Adobe RoboHelp® 10. 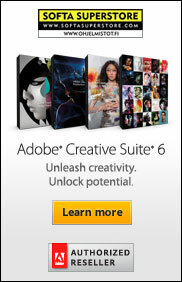 Enrich content with graphics, demos, and more using Adobe Illustrator® CS6, Adobe Captivate® 6, and Adobe Presenter 8. Q: Who should use Adobe Technical Communication Suite 4? A: Technical Communication Suite 4 is ideal for technical communicators, information architects, designers, developers, instructional designers, help authors, eLearning professionals, policy and procedure documentation specialists, knowledgebase experts, user assistance designers, engineers, web developers, and other complex documentation specialists who want to single-source content, enrich content with multimedia, and publish the content to multiple channels, formats, and screens. 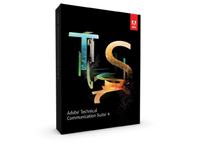 Q: What are the components of Adobe Technical Communication Suite 4? 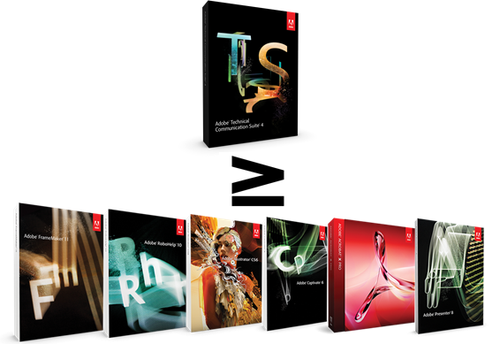 A: Adobe Technical Communication Suite 4, combines Adobe FrameMaker® 11, Adobe RoboHelp® 10, Adobe Captivate® 6, Adobe Illustrator® CS6, Adobe Acrobat® X Pro, and Adobe Presenter 8, as well as additional tools such as Adobe Bridge CS6, RoboScreenCapture® and RoboSource Control™. Q: What are the top new features in Adobe Technical Communication Suite 4? A: Adobe Technical Communication Suite 4 completely transforms your structured authoring experience and leverages the multichannel, multiscreen HTML5 format to publish to virtually any device. Natively author XML/DITA content in FrameMaker® 11 with role-based views, XSLT, XPath, and DITA 1.2 support. Take advantage of screen profiles, layouts, and automatic resizing to enable myriad user experiences using RoboHelp® 10. Create HTML5-based mLearning content using Adobe Captivate® 6. To install an upgrade version of Adobe® Technical Communication Suite 4, you must have an eligible earlier version. For information on eligibility, visit: www.adobe.com/go/tcs_upgrade.